We created the MoneySense All-Star Stocks guide 12 years ago to help point you to some of the best Canadian stocks on offer. This year we have once again crammed it full the information investors love, including All-Star teams from both Canada and the U.S. We weigh up the merits of each of the largest stocks in both countries and our All-Star teams contain those with the best growth and value characteristics. We’re pleased to say that our efforts have been highly profitable. 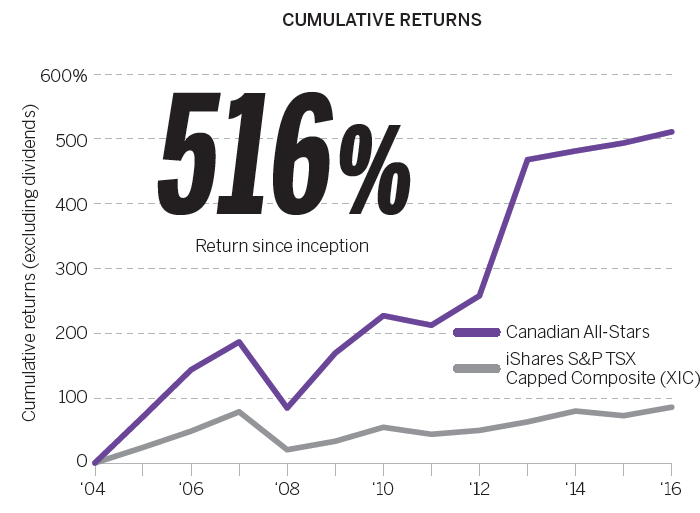 Our All-Star Canada stocks climbed by an average of 14.7% per year since we started in 2004, not including dividends. That assumes an equal dollar amount was put into each All-Star Stock in the first year and rolled into the new All-Stars each year there after. By way of comparison, the S&P/TSX Composite (as represented by XIC, the iShares S&P TSX Capped Composite exchange-traded fund) climbed 4.6% per year over the same period. In other words, the All-Star Stocks beat the market by an average of 10.1 percentage points per year. If you had split $100,000 equally among the original All-Stars 12 years ago and moved into the new stocks each year, your portfolio would now be worth approximately $516,000. That’s more than five times your original investment. Those who invested in the index fund turned their $100,000 initial investment into only about $172,000. It is important to point out that our method has had its ups and downs over the years. For instance, the market suffered from a crash of historic proportions in 2008 that saw the All-Stars lose almost 33% from November 2007 to November 2008. However, the All-Stars have trailed the market in just four of the last 12 annual periods and only twice since the crash eight years ago. While we’d love to be able to say that market crashes and downturns are a thing of the past, every stock-picking method stumbles from time to time. We fully expect the All-Stars to trail the market, or even lose money, on occasion. In addition, a few highly-promising stocks will inevitably disappoint. While we do our best to avoid such situations, investors can’t enjoy the market’s rewards without taking on some risk. To come up with our All-Stars, we evaluated the 200 largest companies in Canada by revenue, using data from Bloomberg. Each firm is graded in two fundamentally different ways. First we consider a stock’s merit as a value investment and then we determine its appeal as a growth investment. Our value and growth tests employ a bevy of detailed calculations that are based entirely on cold, hard math. Our feelings or intuitions about a company don’t enter into it. But, at the end of the day, we sum up everything about a stock in two easy-to-understand grades with one for value and the other for growth. The grades work just like they did when you were in school. The top of the class get As. Solid firms get Bs or Cs. Those that are lacking get Ds or even Fs. Stocks with good grades are deemed to be worthy of consideration while those at the bottom of the class should be treated with caution. The select group of stocks (14 this year) that get at least one A and one B on the tests win a spot on the All-Star list. But, before we reveal this year’s All-Stars, let’s take a closer look at how the grades are granted. Value investors are bargain hunters at heart. They like solid stocks selling at low prices. That’s why we prefer companies with low price-to-book-value ratios (P/B). This ratio compares a firm’s market value to the amount of money that could be theoretically raised by selling its assets (at their balance-sheet values) and paying off its debts. A low P/B ratio provides some assurance you’re not paying much more for a company than its parts are worth. To get top marks for value, a stock must have a low P/B compared to the market and also compared to its peers within the same industry. Because we know investors like to rub more than a couple of pennies together, we award extra marks to firms that pay dividends. As it happens, dividend-payers have generally outperformed miserly firms that don’t pay dividends. All of these factors are combined into a single value grade. Only 20 out of 200 stocks got an A this time around. Growth investors love firms with increasing sales and earnings. That’s why we award higher marks to companies with reasonable sales-per-share and earnings-per-share growth over the last three years. We also track each firm’s growth in total assets over the last year to get a sense of the momentum in its business. 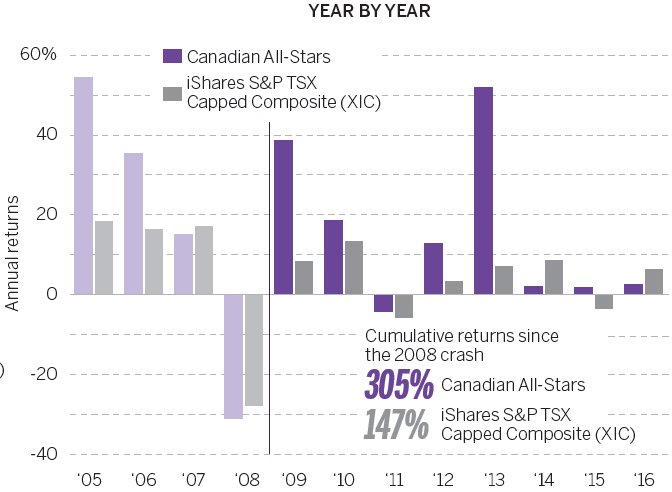 Our All-Star Stocks for Canada have underperformed the S&P/TSX Composite on occasion, including the past 12 months. But since we started in 2004 the All-Stars have dramatically outperformed.